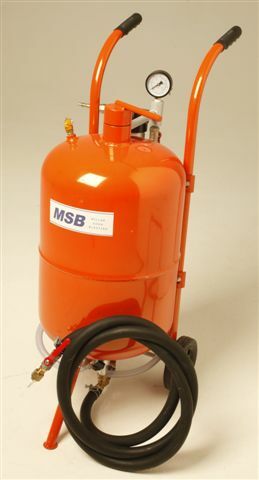 To quote Classic and Sports Car magazine, " Few products have impressed the C&SC garage team as much as this handy soda blaster". And to confirm this, we are delighted to say that our soda blaster and soda/hard media blaster was awarded "Best Product of 2010" by Classic and Sportscar Magazine. The blaster is fitted with our own metering valve specifically designed to flow soda correctly and in the exact proportion to allow smooth soda blasting of any surface at variable pressure. Comes complete with everything you need to load up with soda (not included) and start blasting, including full instructions and face hood. Requires a compressor supplying a minimum of 8cfm. We strongly recommend the use of Armex Flow XL soda for smooth operation. We've tried em all! Our pots are not always orange. We use grey pots on a fairly regular basis. The quality is equally as high. N.B. Please be very careful when buying a blast pot of any kind. There are a number of pots for sale at the moment that are just plain dangerous. They look almost identical to our pots (though usually tend to be red) and are made of considerably thinner pressed steel. They are usually (though not always) remarkably cheap. You really don't want to be near one of these pots if they suddenly decide to let go. They can do some serious damage. If you see one and think "goodness, thats remarkably cheap", there's a reason why. Be warned!